I'm making my way through The Forger's Harvest, and absolutely loving it. But I've had enough of sitting on the sidelines and reading about plants, today I decided to do something about. So, on my way to the bus stop I snapped some photos of a tree and decided that later in the morning I'd identify it. I picked this particular tree because the red berries helped it stand out. Besides, I was curios if the advice we'd given our 8 year old held for this tree: eat the berries and you probably won't die, but you'll get awfully sick to your stomach. After all, that's always the advice I'd been given. I figured I'd go about this as scientifically as possible, and so I started with the aborday.org's tree identifier. After answering a few questions, I realized that I was no longer being asked anything nearly relevant about the leaves in question. After a few more formal identification attempts, and I came up with nothing. 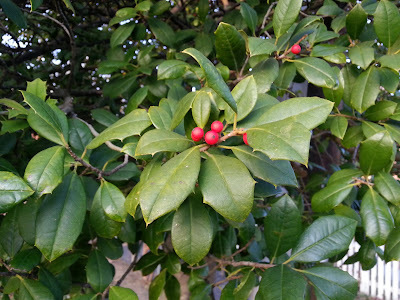 So I totally cheated and typed tree identification berry. I scanned the pictures and realized I had a match with this one. 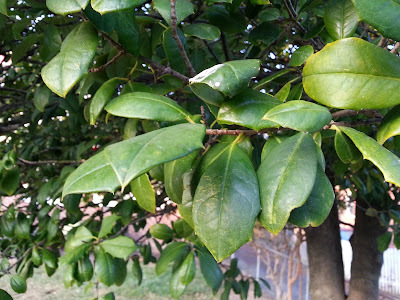 The caption claimed I was looking at American Holly. I did some further examination and realized that was the case. I suppose if I had to have guessed, I probably would have thought it was holly - but not celebrating Christmas, and having never had a holly wreath, it would have been just that - a guess. This left me with two questions: (a) are the berries poisonous? (b) are there any uses for the tree? Well what do you know, the advice we gave our kid was exactly correct. Huh. And does it have a use? Yes! Ignoring its magical properties for now, it can be used to create a tea. Apparently the American Holly version doesn't contain caffeine, but other variants of Holly do, can make for some excellent tea. Apparently, American Holly can be made into tea as well - so if I get the chance to collect some leaves I may in fact give this a try. By the way, the act of drying the leaves is apparently enough to detoxify them. Without that step, you'll apparently puke your guts out. All in all, very educational. I wonder what I can discover on the next trip to the bus stop.